19 June 2008, at 2:04p.m. CASABLANCA, MOROCCO - The Hubbard technical seminar organised for the Moroccan hatcheries and producers held in April 2008 used the theme: "Better production to gain more". The seminar gathered the vast majority of the hatcheries and producers resulting in many fruitful discussions. During the seminar several subjects were addressed. An overview on the global poultry market was given by Jean-François Hamon, Hubbard's business director for the region. The major increase in costs of raw materials is certainly a key issue. This pushes the industry for a further improvement in productivity to keep the cost price as low as possible. The Moroccan producers had already understood this message some years ago and have made the necessary improvements: better management and technical equipment of breeder houses and hatcheries, the upgrading of feed mills and the renovation of many broiler houses. Dr. Eric Bonjour, director veterinary services for Hubbard, talked about the implementation of the quality assurance scheme in Morocco which is very similar to the French "Chartes Sanitaires". Morocco has now reached a good level of bio-security and is responding to the same level of requirements as many other countries. Michel Clech, senior technician for Hubbard, showed the evolution of the breeder results. Michel collects and analysis the breeder field results already for many years, giving an objective picture of the technical achievements. Again this year the results have improved, with some new record-breaking results for the Hubbard JV and Hubbard Classic. The analysis also showed that the change from open-sided to dark-out houses improved the results with 4 to 5 chicks per breeder female placed. Claude Toudic, senior technician and broiler specialist for Hubbard, used his extensive experience in broiler growing and his knowledge of the situation in other parts of the world to present some practical solutions for further improvement. It is not always necessary to go for the most sophisticated solution, it is often better to choose a solution adapted to the local circumstances instead. A wide use of the best practice methods and tools for broiler production now needs to be implemented into further detail; this will then allow the Moroccan industry to "better produce to gain more"! 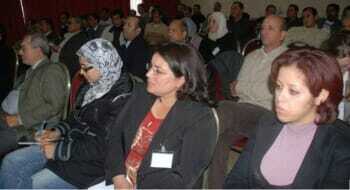 With full agreement of all attendees, Hubbard announced the organisation of a technical seminar in 2009. It is expected that then once again the industry will be able to show record breaking results.